Seek Govinda! Seek Govinda! Seek Govinda! Oh ignoramus, at the time of death the rules of grammer, which you are trying to cram and master, will not be able to rescue you at all. Oh, Fool! give up your insatiable desire for earthly possessions; be sensible and develop serenity and contentment. Be satisfied and happy with whatever you may earn by the sweat of your brow and whatever has destiny marked for your lot. When youth is gone, where is lust and its play? Where is the lake when its waters have dried up? Where are the kinsfolk when riches are gone ? When Truth is realised, where is the snare of Samsara? Crazy man ! Why do you worry so much about your wife and property? Why don't you seek out the Truth? Know that in these three worlds it is only the association with the good and holy that can help you in crossing safely the ocean of life. The body has become decrepit, the hair on the head has turned completely gray; the mouth has become totally toothless; the back is bent down and the old man cannot take even a step witout the aid of his stick; yet he does not loosen even a bit, his hold on the bundle of desires. One may have bathed in the holy Ganges or even in the Ganga Sagar; he may have performed many charities and observed many vows; yet unless one has glimpsed the Truth (God), he will not gain release even after a hundred lives. Who can disturb the peace and happiness of a man if he has the true spirit of renunciation and has controlled his desires, even if he be the poorest, sleeping only in the temple halls and choultries or under trees or on the bare ground and just with a deer skin to cover. Whether one is immersed in yoga or is revelling in bhoga (i.e, outward enjoyment), whether he is enjoying himself in social company or has retired into solitude, true happiness certainly cannot be his; but who alone is revelling inwardly in Brahman, (wherever he be), he alone will be truly happy and will verily enjoy. Even a little study and understanding of the Bhagawad Gita, or sipping of even a tiny drop of the waters of the holy Ganges or even a little worship of Murari -- these will surely save one from confrontation with death! Undergoing the pangs of birth again and again, passing through the throes of death again and again, lying in the mother's womb over and over again, this process of samsara is hard to cross over. Save me from it, Oh merciful Lord ! Clad in stray rags, treading the path beyond good and evil, caring for neither earning merit by taking to good deeds nor stooping to do any evil, and lost in meditation the yogi revels in the Supreme always, lost to all outward norms and decorum -- his behaviour may look prankish like that of a child or may be even queer like that of a lunatic. Who are you ? Who am I ? From Where did I come? Who is my mother, who is my father? -- enquire thus and you will then realise that the entire world of experience, all the worries and problems are but a dream, a mere hallucination, born of imagination and delusion. With such a realisation, you will be freed from the delusions of the world. In you, in me and everywhere, there is but the one Vishnu. Mistakenly viewing me with a sense of difference, you are ill-disposed towards me. Try to see in all beings only the Vishnu who is your own self. Give up your false and egoistic sense of separateness from other beings. Cultivate a sense of kinship, unity and oneness with all. Free yourself from lust, anger, greed and delusion. Contemplate on 'who you are'. Enquire within yourself, who am I? The fools who fail to apprehend the Self are caught in hell-fire even here and now itself and suffer torture. Recite the Gita; chant the thousand Names of the lord (Vishnu Sahasranama), meditate ceaselessly on the Consort and Lord of Lakshmi; lead the mind towards association with the good. Give away your wealth in charity to those in need and who are poor. As readily as one takes to indulging in carnal pleasures, with the same readiness, alas, he is taken over by disease too. Even seeing death as the inevitable and only end of all, man does not refrain from sinful ways. It is wealth only that causes all harm and brings about one's ruin. Bear this truth in mind always. Know that the pursuit of wealth does not lead one to happiness at all. The rich fear and are even afraid of their own sons. This is the outcome of riches anywhere and ever. Regulated breathing and sense control, discrimination between the Enduring and the fleeting, the Eternal and the transcient, Japa and meditation, and submerging of the bodily and mental consciousness in the Consciousness of the Spirit, merging oneself into the total Inner Silence -- one must practice these with unrelenting fervour. Surrender yourself to the Lotus Feet of the Guru; with your senses and mind disciplined, and freed from the shackles of Samsara you will behold the Lord who is seated in your heart. "Seek Govinda, Seek God, Bhaja Govindam", in this refrain comprising of two words, Sri Sankara Bhagavatpada, has summed up in a nutshell as it were, the entire preaching of Vedanta and religion for the redemption of mankind. It gives us the key for entering into the realm of Bliss, the abode of Govinda and for terminating the misery of life we are in at present. 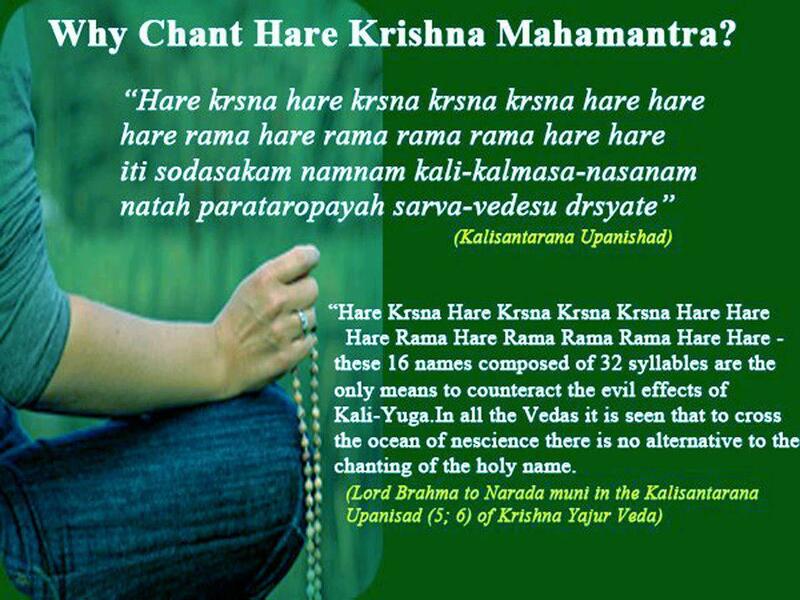 When chanting these names, you can start each name with Om and after each name with namaha, such as "Om Akhurath Namaha". This mantra is depicted in the hymn to kAli named ‘dakhshinA kAli stotram', which is also called the ‘karpurAdi stotram' stemming from its first word ‘karpUr' which literally means camphor. The word ‘dakhshinA' in this context means ‘south' as She is traditionally seen as facing south. One meaning of the word ‘dakhshinA' is ‘a fee paid to a priest', inappropriately alluded to by some in this context. The base word, ‘dakhshin' also means right (as opposed to left), like referring to the right hand. The root ‘dakhsha'means ‘skilled' or ‘ expert'. This is in semblance with the Latin ‘dexter' for right- handed, with the same root giving ‘dexterous' and ‘dexterity'. (The left is ‘sinister'). One puja text explains that the departing souls who are heading south towards ‘hell' are rescued by the goddess, who is facing in the same direction. The Southern transit of the sun is also connected to the ‘night of the gods', so She may be said to be facing the ‘night'. ‘dakhsha' is also the name of the father of the Goddess in another form as ‘satI'. And in there is the story of the death of Sati because her father did not invite her consort shiva to his great fire-ceremony. The gods ended shiva's ensuing dance of destruction by slicing the body of satI into fifty-one parts. 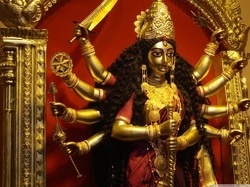 The sites at which her body fell gave rise to the 51 ‘shakti-pithas' all over the Indian sub-continent. The dakhshinA kAli mantra is described in the first six verses of the karpurAdi stotram in terms of its individual parts and letters. 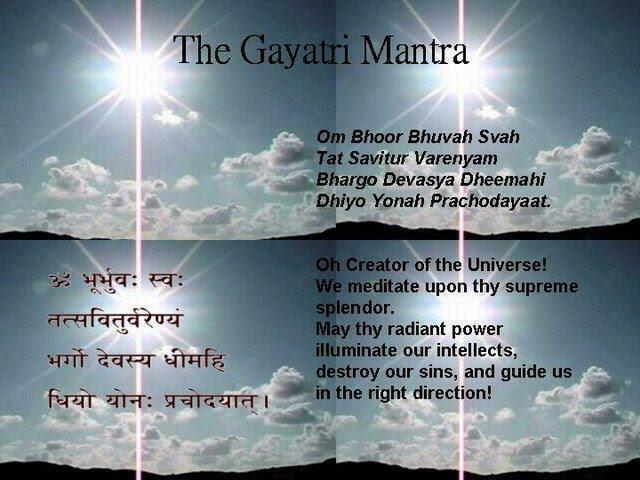 The mantra consists of 22 syllables. In Sanskrit, the syllable is the ‘akhshara'. The word could mean letter (vowel or consonant) but also means ‘that which is not dissipated'. The root ‘khsara' means ‘that which is destructible'. So, Brahman, ‘the ultimate reality' is expressed in the ‘akhshara'. The Bhagabat Gita thus refers to ‘akhshara Brahman'. krim krim krim, hum hum, hrim hrim, swaha. The mantra is preceded by ‘om' or ‘aum'. It consists of three ‘bija' or seeds, krim, hum and hrim, and the name ‘dakhshinA kAlike' and ‘swaha' signifying offering. The Sanskrit script shows the first seven terms of the mantra preceded by the ‘Aum' on the first line. The ‘dakh-shi-nA-kA-lI-ke' (six syllables) on the second line. The last line shows the last nine syllables ending in ‘swA-hA'. The end sound of the seeds are between ‘m' and ‘ng' and are nasalized; krIm ~ krIng, hUm ~ hUng, hrIm ~ hrIng. --------------------------------------------------------------------------------------------------------------------------------------------------------------------------VAISHNAV JAN TO TENE KAHIYE written by the 15th century Gujarati poet Saint Narasinha Mehta, is a devotional hymn popularized by Mahatma Ghandi. It was his favourite hymn and he felt that the lyrics carried the essence of Sanathana Dharma. Singer: Srimati Lata Mangeshkar. (This is a selection of names from the Shri Lalita Sahasranam, the Thousand Names of Devi with the meanings. A lesson in Kirtan everything comes from somewhere and this too is with Raghupati Raghav history there is a person who composed the tune and wrote the Bhajan... I have learned many of the tunes and lyrics that western Kritan singers are singing have originated in India or from some lineage. That there were people who walked before, I think it would be great to preserve the original and create an archive of where these lyrics and tunes came from. I have listened to so many singing chanting kirtan ect... without even the slightest knowledge of where this all is coming from. A Kirtan college or teaching on Mantra, kirtan Indian chanting should at least provide knowledge of this... after all everything comes from somewhere as Bhakti Yoga is Yoga too and it has a huge history.